Everyone is talking about HTML5 and CSS3. If you believe the hype, they will change how web development is done while feeding the world and creating new opportunities for people everywhere to enjoy a new era of peace, love, and rainbow-emitting unicorns. Obviously, I’ve been around long enough to be a skeptic. That said, I do want to keep up on standards and trends, if only to keep my work from causing me embarrassment and to prevent having to do more work than necessary (by having to perform updates soon after code is written). With this in mind, I picked up two books on HTML5 and CSS3. 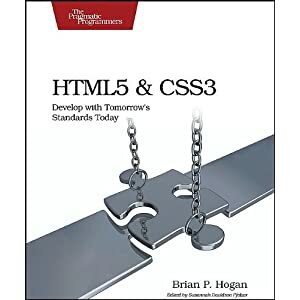 First, I read Pragmatic Programmer’s HTML5 and CSS3: Develop with Tomorrow’s Standards Today by Brian P. Hogan. 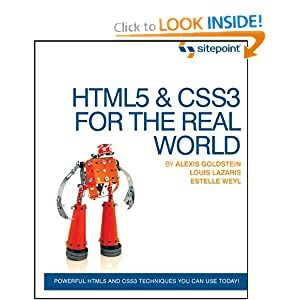 Next, I read Sitepoint’s HTML5 & CSS3 For The Real World by Alexis Goldstein, Louis Lazaris, and Estelle Weyl. This book is also intended for people with experience using HTML and CSS. The basics are often assumed and not covered in great depth. This means that most of the book is dedicated to things the target audience does not already know. In addition, this book also avoids the hype and unicorns and focuses on specific aspects of HTML5 and CSS3 that will be most useful to real world developers. The book includes a real world style example that is used to introduce the similarities and differences in the new versions of HTML and CSS that will make it easy for people familiar with the technology to jump in and do something practical. Bottom line: both books are good, but HTML5 & CSS3 For The Real World covers more features and does so using better examples. I’ll give it a 5/5 and rate HTML5 and CSS3: Develop with Tomorrow’s Standards Today a very close second at 4/5. Disclosure: I was given my copy of each of these books by the publishers as review copies.